Please Note: in the above picture on the right side for size comparison, Left: 25-45 Sharps, Middle: 223/5.6 NATO, Right: 300 Blackout. One Cartridge, Not a Box: 25-45 Sharps by Sharps Rifle Company. New production, 2014, using new brass cases with “FC .25-45 SHARPS” Head/Stamp from a Special Run by Federal Cartridge Company for Sharps Rifle Company only. Loaded with a 87 grain “Speer Hot-Cor” JSP ( Jacketed Soft Point) projectile. 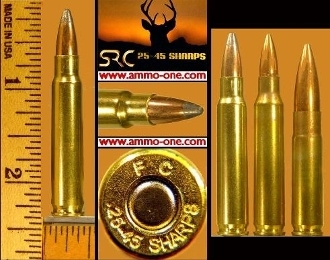 History of 25-45 Sharps cartridge: . Introduced by the Sharps Rifle Company in 2014 as the 25-45 Sharps and was designed by increasing the case mouth of a .223 Remington (5.56x45mm NATO) to accept .257" or 25 caliber projectiles: .25caliberx45 Sharps equals 6.35mm x 45mm in metic terms. This is another AR-15 ready cartridge, like the 300 Blackout, you can use the same ammunition clips of the AR-15's 223 Remington (5.56 NATO) for the 25-45 Sharps, just change the upper AR unit. The Ballistics, are about the same as a 250 Savage.